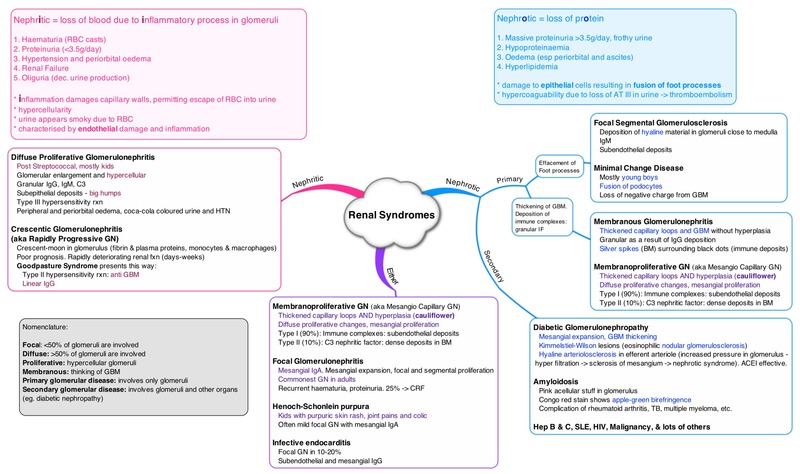 I never really understood nephrotic and nephritic syndrome, but now it makes a little more sense! Thanks! Hi, thanks alot for the wonderful resource. May I please ask which book did you get this information from? Thank you. A well represented guide lines. Now i understand better between Nephritic and Nephrotic syndrome.Thank you. HSP is simply IgA Nephropathy plus the purpuric skin rash. Quite clear and well organized chart! Well done guys! Thank u for giving a gud knwledge about nephritic and nephrotic via ray diagram. - This document lists the symptoms of all the respiratory disease I came across in the rspiratory module in my first year of medical school. - I made this simple nephron outline to show where different drugs act. I found it useful to print it and write notes on the page. - Prezi outlining mitral stenosis, mitral regurgitation, aortic stenosis and aortic regurgitation.